General purpose of this article is to Analysis on Basic Financial Terms. 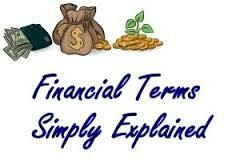 Here briefly explain Financial Terms with explanation and examples. Assets are generally considered with regard to asset classes. An asset class would be the group to which an asset belongs and also the main groups are regarded as being: cash, fixed interest, property or home, shares. There are various other classes even within individuals basic groups. The term investment has been used and you could be wondering what the difference is between saving and investing. Saving is often for short-term goals for easily available cash such as deposits from the bank and call balances.